When it comes to National Parks, Big Bend certainly has all the right ingredients necessary. Rivers, mountains, canyons, dark skies and fossils, are just a few of it’s amazing features. Since it’s also one of the least visited and largest National Parks, there’s enough space to explore and not feel crowded. If you choose to visit in June, which is low season, like we did, you’ll practically have the park to yourself. Big Bend, located in the desert of Southwest Texas, along the United States/Mexico border, is named after the big bend in the Rio Grande river. The river serves as the Southern park boundary and forms the border between the United States and Mexico. The National Park Service takes care of and administers to approximately 118 miles along the border. Looking across the river into Mexico is a unique park experience. Big Bend surprised us with it’s beautiful mountains. The Chisos Mountains, which are the southernmost mountain range in the United States, are fully contained within the boundary of the park. There is no other National Park that has that unique feature. Fortunately, this means even though the park is located in the desert, the altitude makes the mountain area a good ten degrees cooler than the surrounding areas. Perfect for camping, even in the summer months. The Chisos, highlighted by 7,825 ft tall Emory Peak, are home to a lot of wildlife. One of the park’s greatest accomplishments has been the return of the Mexican Black Bear. Absent for years, they have recently begun to be spotted again in the mountains. The Rio Grande has flowed through this area for millions of years and in it’s wake, left three beautiful canyons in Big Bend. Two of which we had the opportunity to visit. 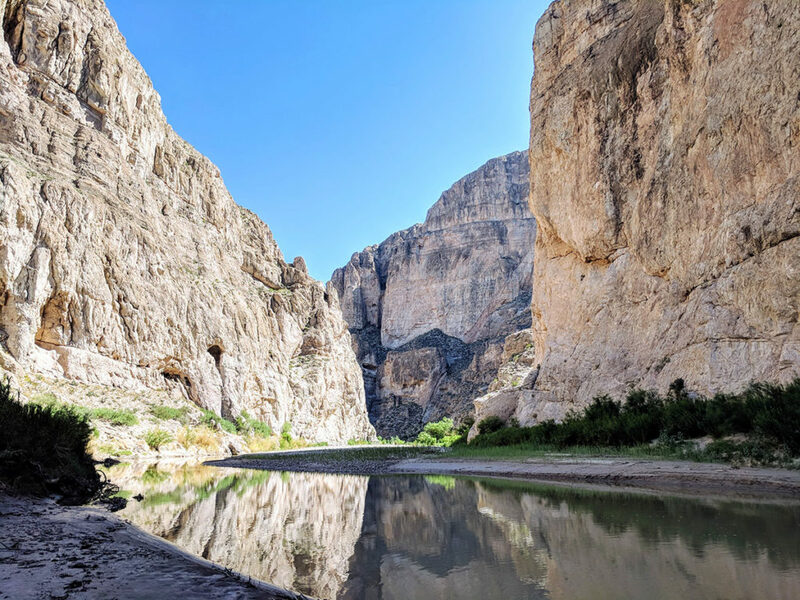 Boquillas Canyon is easily accessible by a 1.2 mile trail that takes you up and over hills, giving you unbelievable views that make you feel small. You can see the surrounding area, including the river and the small Mexican town, Boquillas del Carmen, just across the border. You don’t just have to look at Boquillas from this side of the Rio Grande though. There is a port of entry nearby so as long as you remember to bring your passport, you can cross over into Mexico and check out the town in person. A boat will take you across the river and once on the other side, you can either walk or ride a burro into town. The port of entry is open Wednesday through Saturday in high season and on weekends during low season. Since we were there during the week we didn’t have a chance to cross. If Boquillas Canyon had a big sister, it would be the Santa Elena Canyon. Impressive is an understatement. Once you know where to look, it can be seen from the park loop road. What appears to be a small slit in the rock is a huge canyon carved deep into the limestone, with walls that rise straight up from the canyon floor. Photographs just can’t capture it. You can cross the river to the right side of the canyon, pictured below, and hike up, and then down again to the river. We did only a small portion of this hike because it was 110 degrees and the first section is straight up. Just to show you the size of this canyon, here’s a photo of a kayaker. Look how small in comparison to the canyon walls. 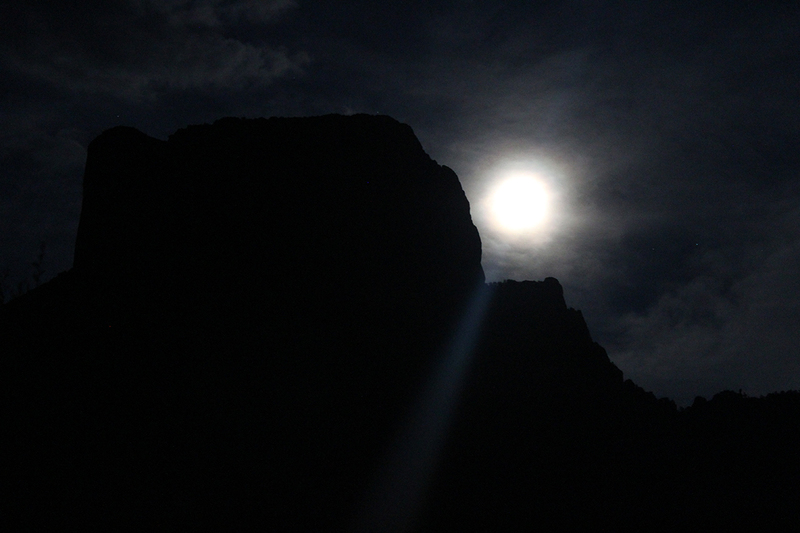 Because of it’s remoteness, in 2012, Big Bend was named an International Dark Sky Park. Not only does it have the darkest skies measured in the lower 48, it’s also the largest International Dark Sky Park to date. Unfortunately, when we were there, it was a full moon and all we mostly saw was, the full moon. Watch for special Ranger led programs thru out the year that highlight Big Bend’s starry skies. You might be surprised to know that dinosaurs once roamed the land that is now Texas. 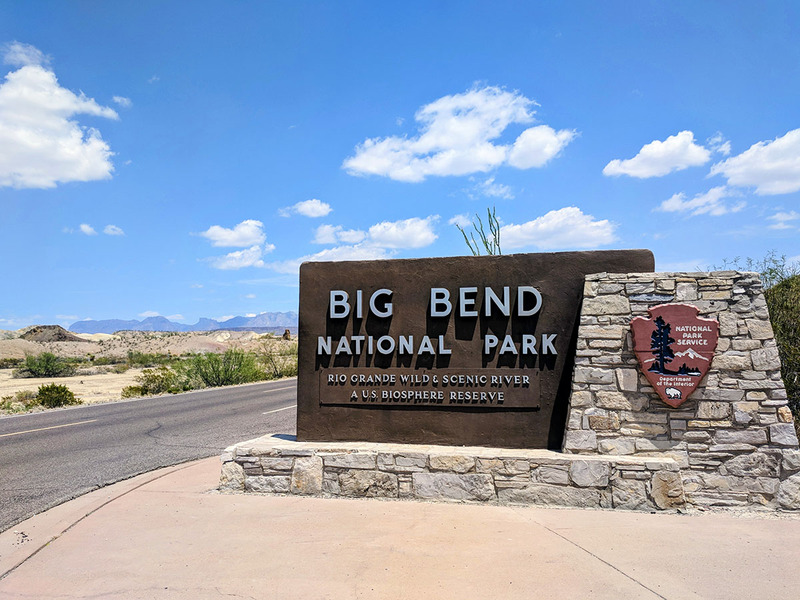 Located eight miles north of Panther Junction on Hwy 385, Big Bend has a Fossil Discovery Exhibit where kids, big and small, can learn about those dinosaurs and view replicas of fossils in an interactive museum and play area. We entered Big Bend from the Northwest entrance on Hwy 118 coming from the west. If you are planning on flying and renting a car, the closest airport is El Paso (ELP). It’s a four and a half hour trip from the airport that takes you on some isolated Texas highways with interesting, quirky towns worth a stop. If you have even more time and want to take a slower scenic route, make a turn on Hwy 67 south out of Marfa. You will end up in Presidio where you can drive Texas 170 or the “River Road”. 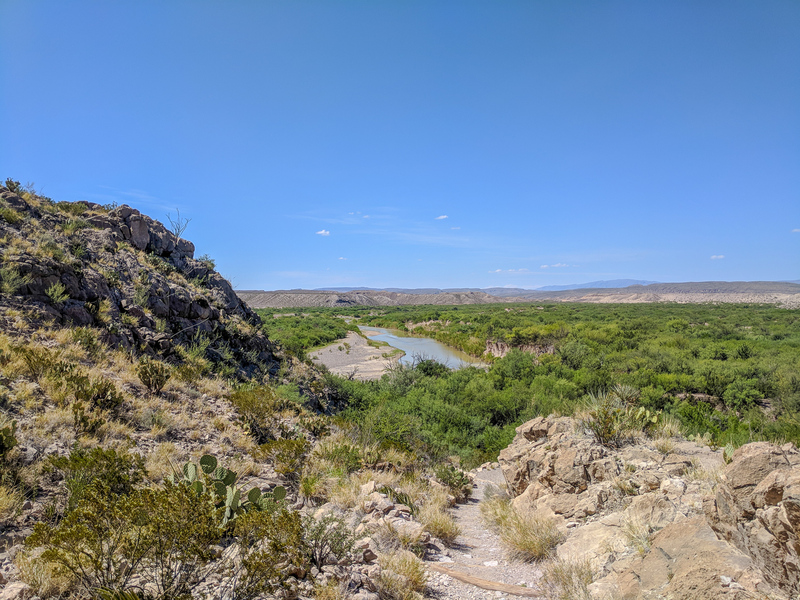 It’s a 120 miles scenic road that passes north along the Rio Grande and takes you through Big Bend Ranch State Park and the ghost town of Terlingua. Because of the remoteness of SW Texas, we used the opportunity to fill the car with gas when we were in a town. Gas is available in the park at the the Panther Junction area. It’s open year round. In case you find it necessary to fill up in the park, gas prices in the park are about the same as outside. The nearest town to Big Bend is Study Butte-Terlingua. There is a gas station and general store there but no large grocery store. Depending on the route you take from I-10, the closest bigger towns will be Marfa, Alpine and Marathon. If you are planning on buying supplies or groceries, it would be best to buy them in those towns. There are camp stores in the park but the selection is limited. We end up eating dinner at the Chisos Mountain Lodge (more info below) a couple of times because we couldn’t make a fire and honestly we were just tired of sandwiches. The food was really good and affordable for a park restaurant. They have a full bar and serve alcohol. A few food items on the menu are: nachos, burgers, salads and some meat and vegetable options. I had a chicken fried steak with mashed potatoes that was so good. They also serve breakfast and have a $8.99 breakfast buffet every morning. Big Bend has a park lodge, three developed campgrounds and primitive back country sites that require permits. One of the unique things about the primitive sites is that some of them are actually roadside so they don’t require any hiking in. You do still have to get a permit. Some sites in the developed campgrounds are reservable during high season, otherwise, you just drive through the campground to see what’s available. 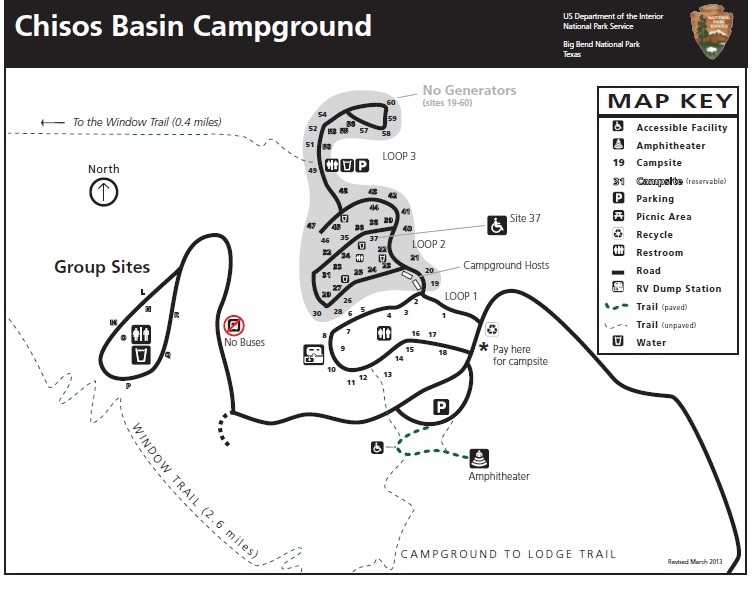 We arrived in the Chisos Basin campground on a Tuesday after lunch and had plenty of sites to select from. Check in with the camp host if there is one. Our host George had a lot of good tips about the park. Plus it’s just a good practice to let someone know where you are and what kind of plans you have. No fires. That included charcoal when we were there. We looked at all the campgrounds and they are all very nice, but because of the heat in the summer, Chisos Basin is the preferred one. Because of the elevation, it’s a good ten to twenty degrees cooler than the Rio Grande campground in the summer and because of sinking cold air, warmer in the fall and winter. It was perfect sleeping weather, even in June. Campsites have grills, bear proof food storage boxes and picnic tables. Most sites are nicely shaded and some even have the picnic tables on a covered concrete pad. If you have a small tent, there should be enough room to set it up on the concrete. This comes in handy in case of a thunderstorm, which we experienced when we were there. There are bathrooms but no showers. Plenty of places thru out the park to to refill your water. There’s also a camp store and the restaurant at the lodge nearby. Note RVs over 24 ft. are not recommended in the Chisos Basin and there is no RV parking. NPS recommends tents smaller that 8×8 ft. This area is it’s own little village and would be really nice in cooler months. In 112 degree June however, it was totally empty. Conveniently located to the Rio Grande, it’s great for water activities and boating. This is the only campground with RV hook-ups and a dump station. Tent sites have picnic tables, grills, bear proof food storage and some overhead shelters. There are bathrooms with flush toilets and plenty of water. During high season there is a camp store, laundry and showers. Quiet and shady, this is the smallest of the three developed campgrounds. Sites have picnic tables and grills. There are pit toilets and water. If you are a bird watcher, this is the campground for you. When you enter, there’s a message board with all the species that have been spotted recently. The lodge has rooms and cottages, gift shop, restaurant (with WiFi) and a bar. It’s also one of the only places in the park where we had cell phone reception. They were constructing a tower nearby while we were there. Even if you don’t plan on staying at the Lodge, you should go by and see it. It sits high up and has a wall of windows in the restaurant and an outdoor deck area for a great sunset view. In the Study Butte-Terlingua area there are several other lodging options and campgrounds. Even though we weren’t staying there, Big Bend Resort & Adventures, allowed us to use their showers since the showers at the Rio Grande village were closed. For $2, you get a six minute shower. It was super clean and spacious. Staff was very nice. They offer rooms, a campground and guided tours. There are five Visitors Centers in the park. Panther Junction and Chisos Basin are the only two open year round. In low season, you can stop by one of those and pick up a map of the park if you find the entrance stations unmanned. The Panther Junction Visitor’s Center also has WiFi and and an exceptional movie about the history of the park. You will also find plenty of water filling stations at the Visitor’s Centers and the bathrooms thru out the park. That comes in handy in that kind of heat because you want to hike with plenty of water no matter how short the hike. Earlier, I mentioned the Boquillas Canyon hike. It turned out to be one of our favorite hikes in Big Bend. We got up early to hike it and beat the heat. Except for a few road runners, we almost had the trail to ourselves. You also might be fortunate enough to meet Jesus, who lives in Boquillas del Carmen. He can sometimes be seen across the river and will sing for you. We really wanted to spend some time on the river in a canoe or kayak. Unfortunately the river outfitters in the area were closed for the month of June. Since many of the trails are so close to the border and the river, you may encounter souvenirs, trinkets and even carved walking sticks that have been placed along the trail for sale. You might be tempted to buy something but there is a warning on park literature about purchasing any of this “contraband”, stating that if found it will be taken from you. 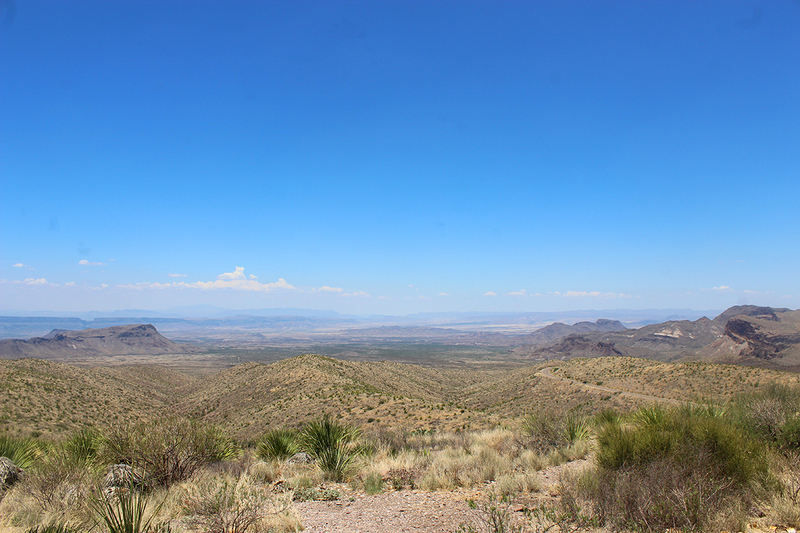 Have you been to Big Bend and have a suggestion of something to do there? Drop me a comment and let me know.